In California, A Union Forms At A Virtual Charter School : NPR Ed After four years of organizing, online teachers win higher wages and student caseload caps. West Virginia. Oklahoma. Arizona. Teachers are organizing for better working conditions all over the country. And now in California, a group of teachers announced today that they are forming a union for an online charter school. The teachers work for the California Virtual Academies, or CAVA—a virtual charter school run by the for-profit, K12 Inc., that enrolls an estimated 12,000 students in the state. 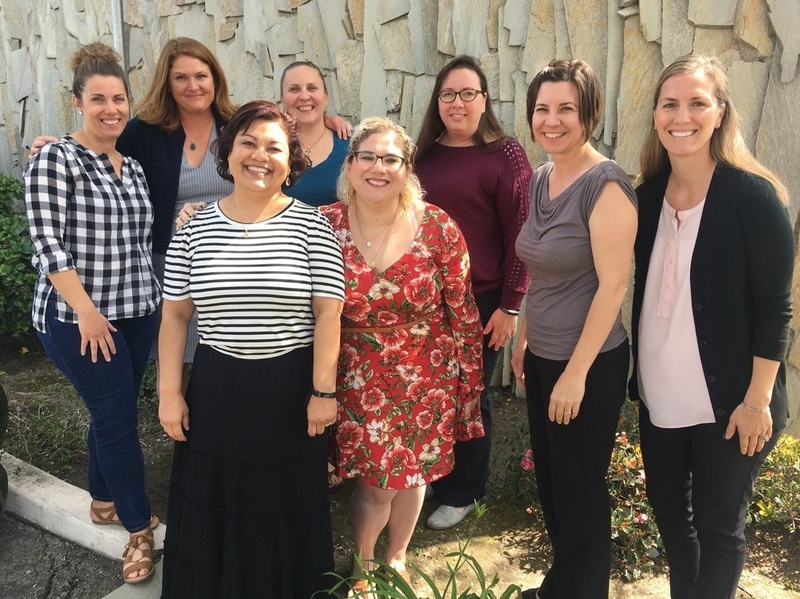 After a four-year organizing campaign, the teachers are joining the California Teachers Association, and have won a contract promising increased pay and lower student-teacher ratios. Members of California Virtual Educators United. Back row l-r: Janine Burns, Brianna Carroll, Kristin McCaffrey, Amy Koller. Front: Sheryl Carruth, Stacey Mankoff, Amber Blodgett, Katie Jamreonvit. Virtual charters are free to families, paid for by taxpayers, and enroll about 300,000 students nationwide. Teachers largely work from their homes, contacting students by phone and online. Brianna Carroll, the new union's president, is based in Livermore, in northern California. She took a job as a high school social studies teacher for CAVA four years ago, and says that as a mother of two young children, she was excited to work flexibly from home while serving families "whose needs can't be met in any brick and mortar setting." But soon, she found school leaders "tying a lot of the policies to follow what K12 wanted rather than what was best suited for students." Pay was low: her salary started at $38,000, she says. Turnover, accordingly, was high and so were teacher-student ratios, with some teachers struggling to serve dozens of special education students. Many school policies changed without warning, especially after the state attorney general reached a $168 million settlement with CAVA in 2016 over alleged violations of California's false claims, false advertising, and unfair competition laws. These new rules included a more stringent "attendance" or check-in policy that, Carroll says, was harder for students to meet. Carroll says she and fellow teachers supported improving the quality of education, but "the way it was done was abrupt, and caused a lot of uncertainty for a lot of people." As we've reported, virtual charter schools run by K12 Inc and other companies such as Connections Academy have come under scrutiny for low performance in state after state. Research has found comparatively low teacher pay and low levels of teacher-student contact to be the norm. Virtual charters, like other charter schools, overwhelmingly are not unionized. K12 Inc. has not yet responded to a request for comment on the announcement. In this most recent wave of teacher actions, educators all over the country have been gathering over social media as well as with more traditional organizing techniques. Carroll says that with her colleagues working from home and scattered all over the state, it took "a lot of phone calls" to get to this point. "I come from a line of teachers: my mom was a high school math teacher and she was a rep for her high school's union," she says. "I think I just came from a family that prioritized that it's really important to speak up when you see things that are not morally correct and do something about it."